It is very important that you have the proper sized dog house for your dog. To accomplish this, you have to measure your dog. You take the measurement from the ground to the top of the front shoulder when the dog is standing. If your dog is a puppy you can see the different kinds of dogs listed with each set of dog house plans. You can order the dog house plans that are designed for that type of dog. Feel free to email, so that we can help you choose the right size dog house plans. The model of dog house plans that you choose would be a personal preference depending on your pets needs. The 1 dog/1 door dog house plans are for 1 dog and has one door. The 2 dog/1 door dog house plans are designed primarily for two dogs that love to be together. These dog house plans allow your dogs to sleep together in one sleeping area. If your dogs do not get along, then the 2 dog/2 door dog house plans are the plans for you. The 2 dog/2 door dog house plans are the most versatile plans available. These dog house plans have two removable wind walls and one removable centre partition wall. This means that all walls can be removed if so desired for your dogs to be able to be together, or separated completely with each have their own space if they don't get along. These dog house plans are used primarily by owners whose dogs have disputes or don't want to share their sleeping quarters. In some cases the disputes are not constant, so with these dog house plans the centre wall can either be put in or left out as the need arises. The 3 dog/1 door dog house plans are designed for three dogs that get along. With these dog house plans all three dogs have one sleeping area behind the removable wind wall in the cold weather, or the entire house when the weather is warmer and the wind wall is removed. These dog house plans make for a very large dog house. There are no special tools required to build any of these dog houses. If you plan to build one of our houses using our dog house plans the only tools required are: a hammer, square, handsaw, or a skill saw, drill, and jigsaw. No. The dog house is designed so it is sitting up off the ground. This way the air can flow underneath the dog house, and it will not create moisture on the bottom of the house. The dog house plans will show this in detail. The roof is slanted so that rain and water can run off. This also allows the dog to be able to jump up unto the roof of the house and lay down. Don't be fooled by other dog house plans that have a peaked or barn style roof. These types of roofs on dog houses are ideal places for wasps, hornets and other types of insects or animals to congregate and build nests. It is also a tremendous heat loss for the house. This is why our dog house plans are tested and proven successful. 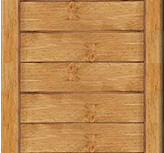 The dog house plans include the instructions for an optional outside kennel attachment in each set of dog house plans. The outside kennel attachment is designed to be able to attach the dog house to the outside of a kennel, which will allow more room for the dog on the inside of the kennel. This is detailed in the instructions of the dog house plans that you order. Can these dog house plans be used for other animals? 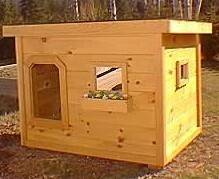 You can make payment for these dog house plans by credit card from the order form on our web site at: http://www.doghouseplans.com/order.cfm using the secure server at paypal with visa, or mastercard. Paypal will email you a receipt immediately when you have made payment for your dog house plans and will also notify us when your payment for the dog house plans has been received. At this time we send out a confirming email to you, to make sure that you were able to download the dog house plans successfully.